Traffic on our tiny blog went to Statistical Outlier City this weekend when Apartment Therapy featured our nightstand project. 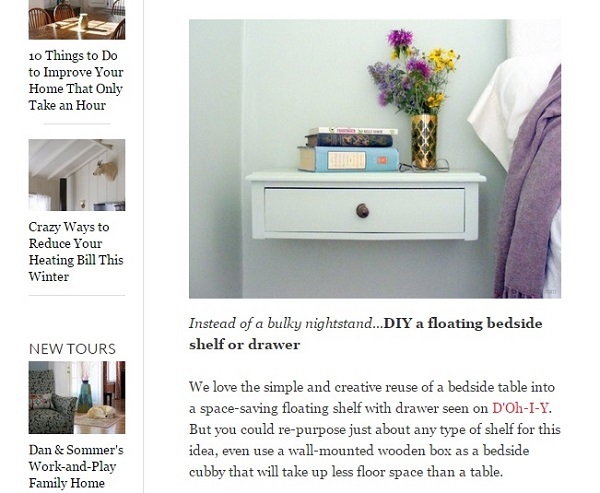 Thanks for including us, Apartment Therapy! What a nice surprise! In addition to giving me the warm fuzzies, the shout-out also prompted me to provide an update on the project, which I’ve been meaning to do for a while. Would we do it again? Yes! It’s so functional for our space. As of yesterday morning, in its typical unstyled state. A commenter on AT noted that floating shelves preempt storage that would otherwise be allowed by a standing piece of furniture. That is absolutely true in most cases! Here, though, the floatingness allows Kev to access drawers in the storage bed easily. 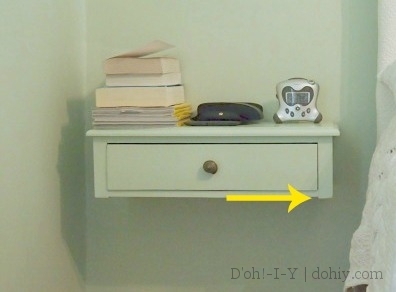 That provides more storage and storage access than we would otherwise have with a regular bedside table. From a use-of-space perspective, this unit has been very helpful. The unit ends up having a lot more weight on it on a regular basis than shown in the original post. As you can see, there’s a stack of books and magazines, as well as a collection of small electronics and glasses. Sometimes, it holds even more books, electronics, or cats. It’s not a large surface area (ergo stacking), but it’s securely fastened, so there hasn’t been any sagging. Kev likes having the drawer, but if I had it to do over, I would try to find an end table with drawer runners. This drawer just runs on wooden supports, just as a lot of furniture does (including our storage bed). That’s fine if you are pulling the drawer straight out, but as a bedSIDE table, Kev is typically opening it from bed, which means the drawer tends to be pulled slightly to the side. The result is that the drawer sometimes jams and doesn’t fit neatly back in its space without jiggling. It’s a minor point, but worth noting. Another thing I would pay more attention to is the leg cuts. On the right side, my cut to remove the leg was slightly (unintentionally) angled. I sanded that off a bit, and it looks ok, but I notice it when I’m on that side of the room. Everyone has their own tolerance for that sort of thing, but I wish I had taken more care with that cut or spent more time evening it up. I could go back to it, but it’s a low priority. But these are very minor issues. The project is a keeper, especially if you are working with a storage bed. 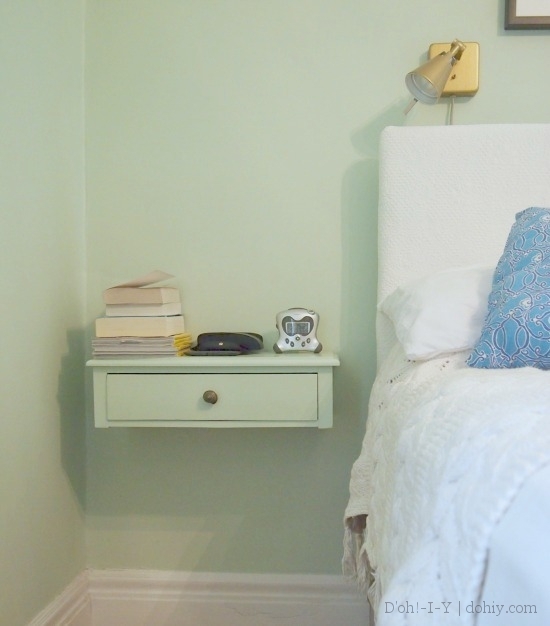 If you’ve converted a nightstand to be wall-mounted, send us a picture — we’d love to see it! This entry was posted in Before & After, Decor, Furniture and tagged converting a bedside table, floating bedside table, floating nightstand, wall-mounted bedside table, wall-mounted table. Bookmark the permalink.